Since Latvia regained her independence, people have been free to practice religion as they please. The early years brought a great resurgence of both Christianity in its many denominations as well as Latvian Folklore with enthusiast groups seeking their roots in pre-Christian traditions. That energy has settled, but winter is still here and will be as long as our tilted planet continues its yearly path around the sun. Christmas is the celebration of the birth of the Christ child, whose birthday strategically coincides with the Winter Solstice, or the longest night of the year. Long have Christian and pagan ideas uneasily shared billing space in Latvia. Early Latvians represented the change in seasons by lighting the biggest log available to symbolize the burning sun. On the shortest night of the year, Midsummer, this burning log was sent rolling down a hill through a gate made especially for the occasion, but at Midwinter the burning log was dragged up the hill, back through the same gate to symbolize the sun’s return. The old Scandinavians, who once had many dealings with the Balts, had a very similar tradition. In fact Yule, is an old Norse name for the sun god and the present-day Nordic word for Christmas is Jul (pronounced pretty much the same way). With the Norman invasion of Britain in 1066, the tradition of the Yule log was passed on to that small island where it was adapted and transformed into the myriad forms it has today including chocolate, tiramisu and virtual. These old traditions make sense as physical representations of the larger-than-life natural processes on which we are all dependant, but how did the Christmas tree come on the scene? 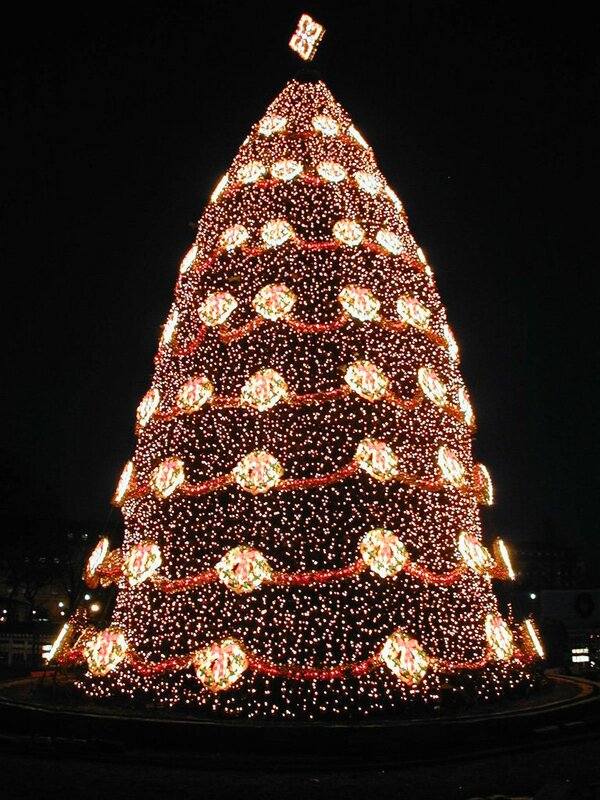 There are several theories or legends about the first Christmas tree. One is that Martin Luther, the father of Protestant Christianity, was taking a walk in the forest one evening and noticed how the stars twinkled through the branches of a fir tree. This inspired him to decorate a small tree at home with lights. Yet another version is that the origins of the Christmas tree come from the medieval mystery plays, specifically the Paradise play staged on December 24th at the feasts of Saint Adam and Eve. 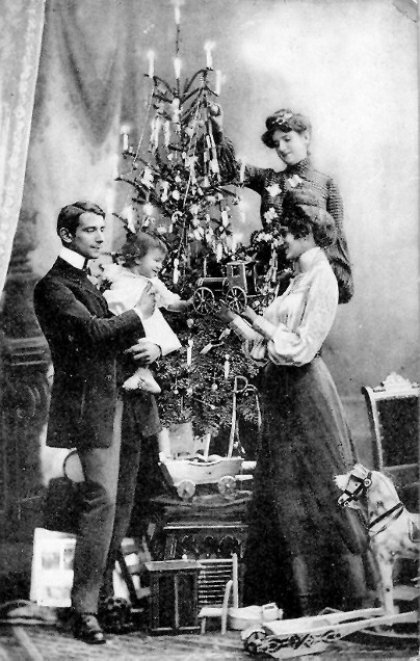 A fir tree decorated with apples was the only stage prop. It symbolized the tree from which Eve plucked her fateful apple. But the oldest written record of a decorated tree is of a cryptic reference to a fir that is said to have been decorated with paper roses. The ceremony was attended by men with black hats who burned the tree afterwards. That event with its far-reaching consequences on both the spiritual and material planes, took place almost 500 years ago in 1510 in a certain Northern European city, namely Riga, Latvia.